For ponds up to 1000 gallons! Thermo-Pond is a unique patented pond heater that keeps a hole through the ice in backyard ponds for just pennies a day. In fact, Thermo-Pond can save up to $30.00 a month in electricity VS. those high wattage stock tank style de-icers! Just think, Thermo-Pond pays for itself in as little as 2 months. 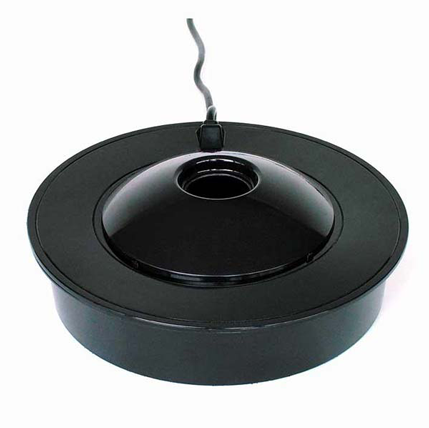 Thermo-Pond floats on top of the water and is thermostatically controlled to never get hot. Unlike some other heaters, Thermo-Pond will never burn a pond liner or plastic pond. It naturally allows the pond to ice over while maintaining a hole through the ice. Allowing that gas exchange can help keep a healthier environment during the winter months Thermo-Pond should be used in ponds that are deep enough to allow plenty of livable water under the iced portion of the pond. One year limited warranty.